This page contains a single entry posted on 16 June 2007 10:49 PM. The PREVIOUS post in this blog is titled > Installed Norton Ghost 12 & Created Back-up Image, called a Recovery Point. The NEXT post in this blog is titled > YaBB Forum Security Vulnerability Patched. Father's day. Not so happy, tho. Was kinda hoping the bug's mom would offer me the day with him, cuz this isn't normally my weekend. But when she came to get him Friday, it didn't happen. Things between us lately haven't been exactly a day at the beach (or a walk in the park). So, can't say I'm completely surprised, tho really thought she'd come through in the clutch. So normally, you might expect this generosity to be reciprocated. But "normal" is not how I'd describe this relationship. I really am trying (for the bug's sake) to normalize relations with his mom, but progress is .. uh, fleeting .. along with hope (of normalizing). I find myself dealing with her as you might an institution, such as the DMV > unpleasant but necessary. You rather not be there, but you gotta stop by from time to time. So you do what you have to .. or more accurately, (you do) what you can. Take nothing personal. Any ugliness > just part of the system. One of the things that suks worst about being a part-time dad is .. you don't have much control over how things turn out for your kids, cuz you're limited in the amount of time you can spend with them. Now maybe this is a good thing, cuz I can say (from experience) that this definitely makes you appreciate your time with them more. Like I've said numerous times, my strategy is to pour as much attention, love, affection & fun into him as I can .. in the limited time I have him each week. I even adjust my non-Bug days to have more to give on days I do. For example, I never work-out very hard on pre-Bug days, so I'm not dragging @ss when I have him. For all the negatives (and I have stories that would curl your hair), you can't imagine how happy I am to see that he likes his mom. I mean he *runs* to her (when she comes to pick him up). He only runs to a few things .. like diggers, dump trucks, the neighbor's trampoline & certain playgrounds. Kids are so transparent. If they like (or dislike) something, it's obvious. Now there have been times when we *asked* him what he wanted (yeah, I know you're not supposed to, but it's important he knows his opinion matters) .. "Stay with dada, or go home with mama?" Friends thought I'd be devastated when he answered, "Go home with mama." And I was somewhat surprised myself, by how I felt, but I was actually relieved. I mean, that would suggest his mom is treating him at least as well as I am. A lot of the tension between us becomes bearable if he's happy with her. This is the main reason today isn't tragic for me. I know he's happy and well cared for. This trumps my own romantic notions of a father/son day together. And let's be honest, if you could be nursed to sleep every night, and wake the same way, I bet you'd also say, "Go home with mama." =) Who wouldn't? There are a million things I could discuss this Father's day. I sometimes feel sad when I see a family all together, and think to myself, "I doubt that guy knows how good he's got it," especially when I see the kids not being treated very nicely. Sure, I wanna say something. Have to bite my tongue. I have plenty of time to think about fatherhood & parenthood in general, cuz I don't have the bug nearly as much as I'd like. But the essence, it seems, on a long-term perspective (looking beyond today's diapers & dinners) is to develop a familiarity with positive things (happiness, healthy relationships, etc.) and avoid developing a familiarity with negative things (contention, arguing, complaining, criticism). Am I making sense? Admittedly, I'm feeling blue today. ... NOT! because they enjoy those things (and I apologize for being deliberately vague, but you understand) .. but rather cuz they found them comfortable (familiar). So we want our kids - when they grow up - to be drawn to the positive things in life, and the best way (I feel) for this to happen .. is for parents to establish consistent patterns of/with positive things (and avoid the negatives much as humanly possible). 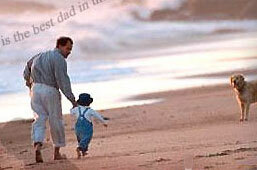 Proverbs says > "Train up a child in the way he should go: and when he is old, he will not depart from it." Admittedly, my version of this principle places more responsibility on the parents (where I feel it belongs, especially when kids are still young). If young children are miserable & ornery, it's likely the parent's fault. Of course, we might disagree on specific priorities, debating which "positive" is more beneficial (e.g. Is it better to take them camping in the mountains for a week or on a plane to see the relatives? ), but I'm sure we could all agree on what constitutes a negative. And having your kids - when they're grown - be attracted to relationships that involve any degree of negativity .. because that's what they find comfortable .. cuz that's what they observed with their parents (their role-models) .. well, let's just say that's not what I want for the bug. I've had friends tell me, "I don't know how you do it. I woulda gone postal by now." The good thing is that we see very little of each other. That helps a lot. And this corresponds to techniques taught in the (court-ordered) Co-parenting classes I attended last year. The key, I feel, is focus. Keep your eye on the positive. While the negative .. gets treated like a trip to the DMV. Maybe she'll have a change of heart and call today, saying, "Would you like to spend Father's day with your son?" .. but I'm not holding my breath. Still, I left the car-seat in the Rad-mobile .. just in case. So, like I said, I do what I have to, or more accurately .. what I can. Here's hoping your Father's day is happier than mine.